If you’ve read the first four articles of our learning center, you should have an idea of the basic aspects of shipping (and if you haven’t, start here with Shipping 101 ). Now you need to find ways to cut costs without sacrificing the quality and speed of your shipping protocol. Shipping is becoming a bigger part of small businesses than ever, and there’s only one thing that’s more important: free shipping. As more and more customers start purchasing their items online, the worldwide movement to offering free or reduced cost shipping is growing. If you can’t improve your efficiency to match this trend, you’re likely to be left behind. First, we need to understand how carriers come up with a rate for your shipment. The most obvious factor in this calculation is distance-the further the destination, the higher the cost. The carrier charges you based on zone and that is determined normally by the origin point and the destination point. From that, the carrier gets a zone and the price is calculated from the distance between the origin and destination. Next is the weight, which isn’t as simple as you might think. Instead of simply charging you for the actual weight of your item, carriers also use what’s known as dimensional weight to charge for the length, width, and height. For more on the dimensional weight calculation and what it means for your business, read Shipping 103. The type of service has a significant impact on the final price, as you will be charged more for options such as express or overnight shipping. Finally, any extra charges and fees are included on top of the original rate. These can include residential delivery, an extended area surcharge, Saturday pickup or delivery, insurance, an oversized fee, and more depending on your specific situation. Some of the most effective ways to minimize each of these costs are covered below. You lose money every time you have a shipment delayed or returned, and these issues are often entirely preventable. If you’re shipping multiple large items for example, it’s generally cheaper to use several boxes as opposed to one to hold everything — UPS, for example, charges a $650 surcharge on oversized items. Weight and size related fees are covered in more detail in Shipping 103. This one seems self-explanatory, but if your shipment is destined to someone that works out of a home office or is destined to a residential location, you’re going to be charged a residential fee for that. There aren’t too many options around this unless you can encourage your customers to have their package shipped to their place of work. There is another option where you can request that the package be held for pickup. The carriers are working hard on making this option available within a short distance from the final destination so it might be an option worth looking at. Another major cause of unnecessary costs is items that are damaged or broken in transit. While these are sometimes unavoidable, and no precaution can entirely eliminate the possibility, there are some actions you can take to reduce risk. First, package your item securely to protect it from any impact. 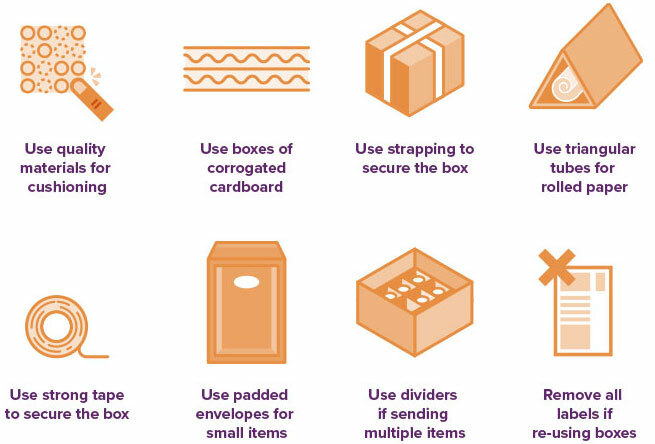 You can see some basic tips above, but for more guidelines on secure packaging, read Shipping 102. Additionally, purchasing shipping insurance will ensure that you’re reimbursed for any damage caused during shipping — my colleague Nadine covered this in her article The Fine Print of Carrier Insurance. While shipping insurance can be a lifesaver when extremely valuable items are involved, it can be extremely expensive and, in some situations, not worth the payoff. If only a small percentage of your packages are being damaged or lost in transit, you should compare the amount you’re losing to the cost of insuring every individual item — it’s often better to take the loss on those few items than to spend extra money on insurance. One frustrating cost is the additional handling fee, which is often applied to shipments with irregular packaging material, or items encased in wood, plastic, or basically, anything that isn't in a cardboard box. This is one of the easiest things to fix, as simply using a standard cardboard box will ensure you avoid any unnecessary charges. Shipments that require additional handling also become exempt from any on-time money guarantee so you can save money for the extra cost and be eligible for money back. One additional cost you might not be aware of is the Fuel Surcharge, which is adjusted and charged weekly by carriers such as UPS. While it’s a relatively constant percentage of your shipping rate, it’s also dependent on the current price of fuel. ← Not much can be done on this front in terms of reducing costs. Some of the other fees incurred during shipping include Saturday delivery and pickup, extended area surcharges, and signature fees. For each of these, it’s worth considering whether the service involved is worth the additional cost. The extended area fee, for example, is applied to shipments from and to inaccessible or sparsely populated areas. If you choose to exclude certain areas from your delivery range, you’ll save money at the expense of some of your customers. Similarly, Saturday pickup and delivery can improve your efficiency and shipping turnaround time, but at an added cost. If it’s important to have your items moving six days a week, it could be worth the money, but otherwise, it’s another way to reduce your costs, and the same goes for the delivery confirmation signature. Individually, none of these will have a massive impact on your operating costs, but they each make an impact, and when combined, they can result in large savings for you and your business. It’s worth taking the time to make sure you’re only paying for the services that are important to your business-and seeing if you can get those services from a different carrier for a lower price. If you’re still dropping your packages off with a carrier, you’re wasting valuable time that could be spent on your business. Most major carriers offer free or low-cost pickups. Again, it’s important to compare the options to find the best rate. By taking advantage of free pickups, you can get the same service without spending any time taking it to a drop-off location. If you can’t access free pickups, consider the cost and location to decide whether or not it’s worth having your packages picked up as opposed to dropping them off yourself. If you’re like most small businesses, you have close to as many incoming as outgoing packages. Every time you throw one of those away, you’re wasting material-bubble wrap, peanuts, boxes, and more-that could be used again. It might seem like a drop in the bucket, but these costs add up over time. By simply using the same packaging items rather than buying new ones, you’ll save a substantial amount of money for your business. One important caveat to this is the box-while eBay sellers and extremely small businesses can often use different boxes for each order, you may want to protect a brand or quality standard by using consistent packaging. Additionally, used boxes have substantially less strength than new ones, so if you’re shipping heavier items, it’s better to avoid the risk. In fact, carriers can deny insurance claims if you shipped with a re-used box, as they can lose up to 60% of their strength. In the past, businesses often stuck with one carrier for all their shipments in order to negotiate a discounted rate. While this is still a viable option for large companies, small or mid-sized businesses can save substantial amounts of money by choosing a different carrier for each individual order. Each of the major carriers offers a different range of services and rates, meaning that none of them is the best option for every situation. By using a different service for each package, based on the weight, value, destination and other factors, you can spend less for the same quality shipping. If you’re not sure how to compare the carriers and their services, Secureship is a great place to start! 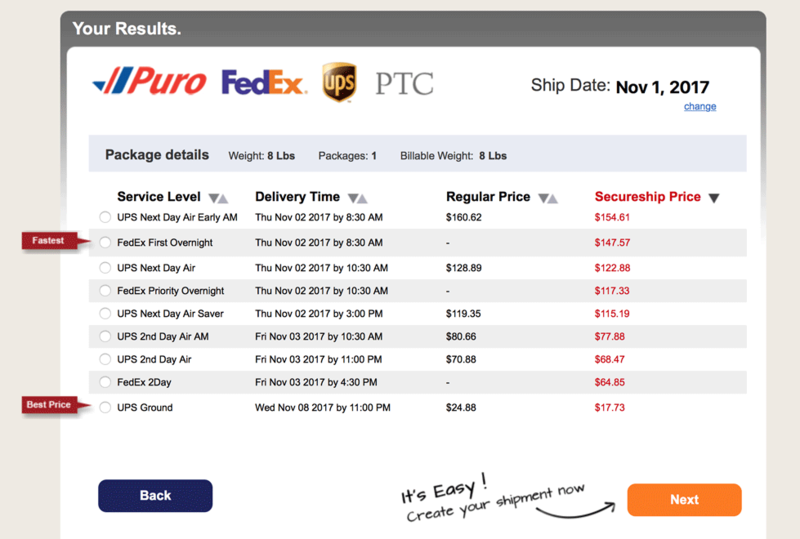 Our Shipping Rate Calculator (shown above) will give you everything you need to make an informed shipping decision. Simply enter the relevant information about your package and compare the available options. Additionally, Secureship members have access to a discounted group rate for further savings. No matter what your product is, you need to ship it, and shipping costs are a factor for nearly every business. They're also one of the most common ways small and medium-sized companies can reduce their costs and improve their efficiency. This page has some great tips if you’re looking for even more ways to save money on shipping. By taking the steps to find the right carrier for your business and only paying for what you need, you can effect major changes in your costs as well as your time. Regularly driving out to a drop-off location, for example, is a huge drain on productivity. Our next lesson, Shipping 106, will show you what you can do to reduce the risk of your package being delayed.